Featured Song "Do the Koopa"
"Do the Koopa" is the fifteenth episode of The Adventures of Super Mario Bros. 3; it aired alongside another episode of The Adventures of Super Mario Bros. 3 entitled "Kootie Pie Rocks." The episode begins with Luigi finding a treasure map to the Doom Dancer Music Box in Mushroomland Central Library. Princess Toadstool later gets Luigi, Mario, and Toad to help her get the Doom Dancer, which makes anyone who hears it dance fast or slow according to how fast it is cranked. Mario proposes that the Doom Dancer can keep the Koopa Clan under control. The group then sets out to get it in Dark Land's Temple of Gloom. 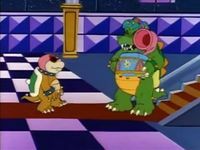 When they arrive, a Dry Bones hears their plans and goes to tell King Koopa at Castle Koopa. 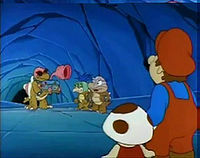 After telling him a few times (King Koopa has a cold), King Koopa sends Cheatsy Koopa, Big Mouth Koopa Jr., and Bully Koopa to get the Doom Dancer before the Mario Bros. do. Mario and Co. face a problem getting over a wide gap. Toad suggests that Mario break some blocks to get some Super Leaves, which Mario does. Turning into their Raccoon forms, the group flies over the wide gap. They run through a field of giant spikes popping down from the cave ceiling. After getting through the spike field, two Koopa statues turn them all back into their normal forms. After traversing through a hallway, the group sees the Temple of Gloom, which is guarded by a group of Dry Bones. The group stomps on all the Dry Bones, but they just reform and get back up. Mario then sees a group of Blocks and tells everyone to break them. The rubble of the blocks block the Dry Bones from reaching the gang, allowing Mario and the group to get into the Temple of Gloom safely. Cheatsy, Bully, and Big Mouth are later seen clearing the rubble, and following the gang into the Temple of Gloom. After narrowly avoiding beams from many Koopa statues, Mario and the gang reach a door. Princess Toadstool looks at the map and tells the group that the Doom Dancer is in the Inner Temple. The Koopalings, who are eavesdropping, realize that the Doom Dancer exists and is not a myth like their father always thought. The Koopalings decide to let Mario get the Doom Dancer, then Big Mouth says they should ambush them. Bully tells Big Mouth to give him his string. Big Mouth objects because it belonged to their great grandmother and attempts to tell an unneeded story about her. Bully covers his big mouth before he starts while Cheatsy steals the string and creates a trip-wire. Traps going off after Mario grabs the Doom Dancer. 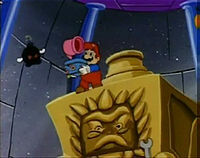 Mario and the group are then seen inside the room of the Doom Dancer, which is on a pedestal. Mario climbs up and obtains the Doom Dancer, which sets off a trap that makes projectiles fall from the ceiling. Mario gets back to the group after narrowly avoiding a Thwomp. A Boom Boom scares the group and sends them running outside, tripping on the trip-wire and sending the Doom Dancer into the air. Big Mouth attempts to catch it while mimicking football game crowds, but Cheatsy pushes and attempts to catch it, but Bully grabs him by the hair and throws him away and the Doom Dancer falls into Bully Koopa's claws. Bully then uses the Doom Dancer to force everyone to dance, even his own siblings. He makes everyone march back to Castle Koopa, plotting to use the Doom Dancer to overthrow his father. Bully with the Doom Dancer. When the group gets to Castle Koopa, King Koopa asks Bully to give him the Doom Dancer. Bully refuses, saying that he is going to use it to rule the entire world, starting with his father. However, King Koopa's cold prevents him from hearing the music, making him invulnerable to its magic. Koopa then takes the Doom Dancer, and cranks it, making everyone "Do the Koopa". King Koopa then says that he is going to make the whole Mushroom Kingdom dance to their doom. The Doom Dancer is powerful enough for its power to spread into Desert Land where a Sphinx, the trees and even the enemies start dancing. King Koopa then flies over various parts of the Mushroom Kingdom on his Doom Ship, making everyone "Do the Koopa", even statues and plants. Mario then gets some Plumber's Putty from Luigi, and jams them in his ears, blocking out all sound. Pretending to dance, Mario slowly goes towards Koopa, tackling him and sending the Doom Dancer into the air. A struggle for the Doom Dancer follows, which ends up in the crank breaking off from the rest of the Doom Dancer. Attempting to crank it with his claw, Koopa gets his claw stuck. The Koopalings help Koopa get it off, but send the Doom Dancer crashing onto the landscape below, where it hits a Goomba on the head and breaks. King Koopa, Bully, and Cheatsy then start arguing over whose fault it is for breaking the Doom Dancer. Mario and the group jump into the Warp Pipe and get warped to Mushroom Castle, where the episode ends. When Mario, Luigi, Princess Toadstool and Toad start flying, Luigi doesn't have raccoon ears and Princess Toadstool doesn't have raccoon ears or a tail. In the scene when Princess Toadstool explains how the Doom Dancer Music Box works, when Hop falls down, his eyelids turn red. Also the red Paratroopas and Dry Bones occasionally stand on two legs, but it is probably that the red Paratroopas walk on two due to their wings, while the Dry Bones are light. When Mario, Luigi, Peach and Toad run towards the Dry Bones, Toad is not wearing pants. When the Dry Bones are in a row, leaving the Temple of Gloom, the first of them disappears on the ground. After Mario escapes from the Thwomp attack, he disappears then he reappears surrounded by Luigi, Princess Toadstool and Toad, although he did not change to small form. When Bigmouth, Cheatsy and Bully are trying to catch the Doom Dancer Music Box, all Bully's skin that is beneath his glasses is brown. After Mario and his friends see Bully with the Music Box, his snout is brown again. The error in which Bully's shell is colored green. When Bully gives Bowser the Doom Dancer Music Box, his shell is colored green. The scene where everyone is dancing on the Doom Ship is ridden with mistakes, including Big Mouth dancing without his feet ever touching the ground, Hop's hair appearing to be completely yellow, Kooky's entire face being orange, all of Hip's hair being blue, and Hop moving from Cheatsy's side to Hip's between scenes. When the Paragoombas and Paratroopas are dancing in the Doom Ship, one Paratroopa has three legs and no arms. During the song, the Angry Sun is completely gray. After King Koopa and Luigi fight for the Music Box and Bowser holds it in the air, the crank can be seen, but afterwards, Luigi holds it in his hand. After Mario hits the Music Box away, it is about to land on the Doom Ship. But then, when Luigi goes to catch it, it is suddenly in mid-air again. At the end, Big Mouth is nowhere to be seen in the argument between Bully, Cheatsy, and King Koopa. When Bully says "He he he he he. Now let's try it slow! ", his voice plays before his mouth moves. At the beginning of the episode, Luigi's voice is noticeably higher. When Mario, Luigi, Princess Toadstool, and Toad are looking at the map in Toad's house, Mario's "M" is colored white. At the beginning of the episode, Boom Boom is shown to be moving on the map, but at Toad's house, he is not. On the map in this episode, there is detail, but in one shot, nothing is shown on the map. In Toad's house, the map is on a table, but when Mario was talking to Luigi, the map was not shown. There is a serious color error in a lot of shots of this episode. When Mario, Luigi, Princess Toadstool, and Toad get to the Warp Pipe outside, the skull symbol is blue, but when they arrive in Dark Land, the skull is shown to be yellow. When Mario was telling Luigi to be quiet, the skull symbol was not shown on the Warp Pipe. The same thing happens when Cheatsy, Big Mouth, and Bully go in the Warp Pipe. When Luigi says "Stop the music!! ", the fire is disappearing and reappearing. When Mario was climbing up the pedestal which was holding the Doom Dancer Music Box, the Doom Dancer was not shown. When Mario was about to get crushed by a Thwomp, the Doom Dancer was colored incorrectly. When Mario, Luigi, Princess Toadstool, Toad, Big Mouth, and Cheatsy were marching, Cheatsy's head was flashing. The same thing happens to the Doom Dancer. In one shot of this episode, Princess Toadstool's castle is orange instead of pink. The title of the episode is a play off "Do the Mario", the song that is used in the closing credits to The Super Mario Bros. Super Show!, the previous Mario animated series produced by DIC Entertainment. This episode breaks the fourth wall twice. Once when Mario and Co. are at the large gap, Luigi screams, "Stop the music!" and the background music stops. A second time when Toad suggests breaking blocks to get Super Leaves, Mario says, "Start the music!" and the background music plays again. On DVD, this episode runs slower, and thus longer, than the other episodes. It is unknown why this happens. 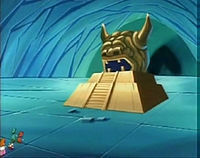 Princess Toadstool references Indiana Jones and the Temple of Doom when she says that the Doom Dancer Music Box is hidden in Dark Land's Temple of Gloom. Toad only has two lines in this episode. His only lines were "Whoa! Try blasting those blocks, Mario!" and "Yeah, but we got the crank!". The pencil-like obstacles in Dark Land, which do not appear in-game, predates the Spikes from Super Mario World, obstacles with a very similar function and appearance, only lacking the tip. This page was last edited on March 26, 2019, at 15:39.